New Shepard is a rocket manufactured by Blue Origin for space tourism. The rocket is designed to take passengers into suborbital space inside of a crew capsule. The capsule features six large observation windows, which Blue Origin says are the largest ever constructed for a spacecraft. New Shepard is fully reusable and as of April 2018, it has made seven test launches. In November 2015, it was the first reusable rocket to successfully make a soft landing on the ground, beating out the more famous SpaceX Falcon 9 booster by several weeks. Blue Origin was founded by entrepreneur Jeff Bezos, who made his fortune with Amazon. Bezos also purchased the Washington Post in 2013. Forbes magazine ranked him as the richest person in the world in March 2018, with a net worth of $112 billion. Blue Origin likely will not bring passengers into space before late 2018 (according to a 2017 article from SpaceNews), but it has released details of the flight path. When passenger flights happen, New Shepard will launch vertically for about two and a half minutes before main engine cut-off. The capsule will then separate from the rocket; passengers will be weightless for about four minutes during the 11-minute flight, and will be high enough (at an altitude of 307,000 feet or 93,573 meters) to see the curvature of Earth. The spacecraft will coast for a few minutes in space before re-entering the atmosphere. New Shepard will land using an autonomous, rocket powered vertical landing system. New Shepard is named after NASA Mercury program astronaut Alan Shepard, who was the first American to fly in space in 1961. Passengers aboard the Blue Origin spacecraft, however, will enjoy more than 10 times the space in the capsule than Shepard did in his Freedom 7 spacecraft. Up to six people can fly into space at once; the interior volume is said to be large enough for everyone to float and move around. The large windows will provide a view of Earth. In addition to passengers, the spacecraft aboard New Shepard can carry standardized experiments of up to 50 lbs. (23 kilograms), with larger options available for custom requests. Prior to flying in space, Blue Origin launched several prototype test vehicles. The first test flight took place in November 2006, and the first vertical landing (which took place after a short flight) happened early in 2011. A second test vehicle in August 2011 crashed due to flight instabilities, according to Blue Origin. Blue Origin received $3.7 million from NASA under the first phase of the Commercial Crew Development program, in 2010. The money was used for a launch abort system and composite pressure vessels. (After several more commercial crew phases, NASA ultimately selected SpaceX's Dragon and Boeing's CST-100 spacecraft in 2014 to eventually take astronauts into space.) Blue Origin also has submitted a proposal for New Shepard to fly research payloads under NASA's Flight Opportunities Program. The New Shepard rocket has gone through a few iterations over the years. The first flight of New Shepard 1 took place on April 29, 2015. While the flight was a success, the rocket failed to land as planned due to losing pressure in the hydraulic system. The capsule made a safe touchdown. The latest flight used the New Shepard 3 rocket. It took place on Dec. 12, 2017, with a reusable booster, a capsule and a mannequin called Skywalker. 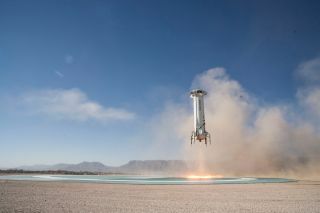 This flight was the first time that a New Shepard rocket flew under a non-experimental permit from the Federal Aviation Administration. This situation allowed Blue Origin to carry several revenue-generating experiments on board the flight.